This is my second tour with this company, having done the Kimberley trip a couple of years ago. As soon as I saw that they now offer the West Coast between Perth and Broome (and vice versa), I knew I had to jump on board. I was not disappointed. We did over 4,000kms in 9 days, which of course is a lot of time driving due to the distance between Perth and Broome, but this didn’t make the trip any worse. We had a fantastic group who all clicked straight away and not being a fully booked tour we also had plenty of room in the van. Our guide Stu had lots of knowledge and was very knowledgeable about the places and things we were seeing. If he didn’t know about something he endeavoured to find out the answer for us. Stu was also flexible and always asked for our opinions so we could have the trip we wanted (sticking the itinerary, but being as flexible as possible with it). We went swimming with a Whale Shark at Coral Bay, which is an optional extra, but our whole group wanted to do this, especially after seeing Stu’s enthusiasm and description of the experience. It was awesome, the whole day at sea swimming alongside a huge ocean creature. He of course took us to plenty of cool places on the coast as well, going to Kalbarri National Park and some other coastal lookouts etc etc. My other favourite experience was Karijni National Park. There is just something so special about the place. The beautiful gorges that Stu took us to were breathtaking and so much fun to explore. He knew the groups capabilities and threw in some fun things along the way. I wish we had more time there, the place is that beautiful. There is something to be said for the beauty of the Kimberley and the West Coast/WA Outback. We also had the added adventure of saving a baby lamb along the way who we helped get back onto his feet and found a home for him in Broome. Stu has a lot of compassion for animals and creatures of all kinds, and this gave an extra little special experience for our group. Our trip kept getting better and better as we went on. We were really lucky with all the cool things we saw and the way the weather turned perfectly for us when we needed it to. We all clicked instantly and had so much fun throughout the 9 day trip. As per usual we had dinner on the last night, but a few of us even had brekkie together the next day and hung out for a bit. Lots of laughter, lifetime memories and new friends were made. If you want to do WA, do it with Kimberley Adventure Tours/West Adventure Tours. These guys are fantastic at what they do, they bush camp and you always have a great time. I was not the only one on my tour who had come back for a second go with them, as there was a couple on my tour who had done the Kimberley with them in the past as well. We all think very highly of this company and I really think you can’t go wrong with making them your tour guide/trip specialist in WA. 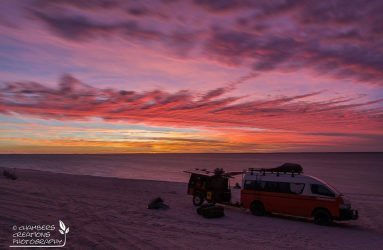 Broome to Perth 9 day tour ! Trip to remember ! I had the most amazing time on this 9 day trip on the west coast ! We were a small group which was really cool, I liked it because our group was on the same page. We all were excited to visit new places, stay active and see as much as we could. We were ready for the adventure. Our guide, Stuart, made our experience even better by being very relaxed, easy going and adevnturous. He taught us a lot. He knew a lot of things which made the trip interesting. He had a good knowledge about it all and a good sense of humour. Always with a few stories and jokes up his sleeve ! The food was really good, lots of choice, variety of menus, healthy, with a few sweets here and there of course, and good quality food which I really appreciated. Usually on organised tours you get cheap unhealthy food, well here it was far from cheap ! The places we’ve visited on the way down to Perth were very different from one another and each had its own charm. 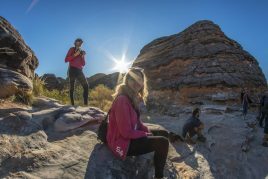 The karijini national park is stunning with all its red rock everywhere, as are the beaches along the coast with white sand and clear blue water (turquoise bay, coral bay, ….). You camp in the wild in your own swag. 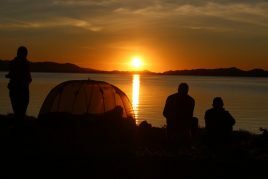 First time for me and I loved this way of camping, with most of the time no one else around, beautiful views, fires. This trip was perfect for me. You go to the most important places on the west coast, and stay in some really amazing wild campsites, meet new people and make new friendships, eat good food, wake up early and go to bed early ! I loved this experience and would not mind doing it again if I could ! I recommend this tour, it is worth it ! Our family of four, two adults and two children aged 11 and 13 joined Stuart for the Perth to Broome trip recently. We loved every minute of it, even being rained out on the first night! It was a true adventure. Stuart said he would challenge us and he did. We accomplished climbs we never thought possible, enjoyed delicious food and slept out under the stars. First time I have ever seen both the moon and sun rise and set in one day. 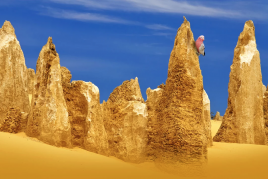 On our list is to do the Broome to Darwin adventure next! Perth to Broome 9 Days of FUN!!!! Wow Wee what an amazing, awesome adventure!! 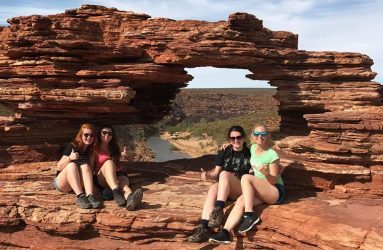 I absolutely loved this itinerary Perth to Broome, such a beautiful region with both coastal and inland experiences! Stu our guide was fantastic! He was so knowledgeable and passionate about the west coast! This trip wouldn’t have been as great without him! We learnt so much, laughed so much and he just knew where all the cool spots were to check out along the way! My highlights were the Whale Sharks at Ningaloo Reef!!!!! 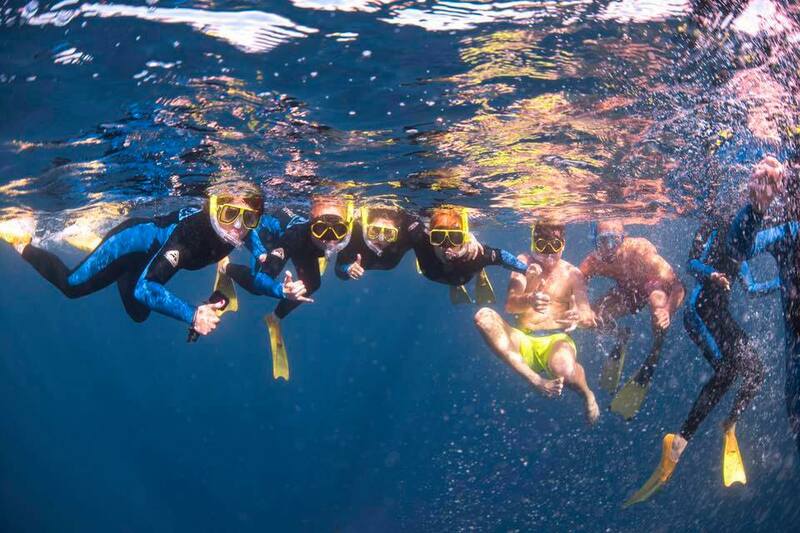 AMAZING experience, and I am not the best snorkeler and it was incredible!! Drift snorkel, beautiful crystal clear aqua water!! Sunsets and sunrises everyday were Stunning!!!! Kalbarri National Park was Awesome, but Karijini National Park was Breathtaking!!! The most amazing rock formations and Gorges that you will ever see!! Hiking, swimming and jumping into these pristine gorges was super fun and refreshing!!! Also these gorges are home to beautiful waterfalls!! 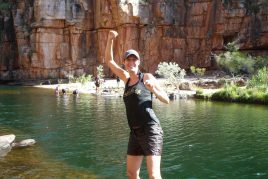 I did my west coast trip with Kimberley Adventure tours and for me it was the most amazing tour ever. Our tour guide Stuart has a lot of knowledge about the west coast, plants, animals, history and so much more. He is really passioned about traveling and that makes the trip so much better. We were only with 5 people and Stu was really flexible. If we wanted to see something else what was close, we did this. 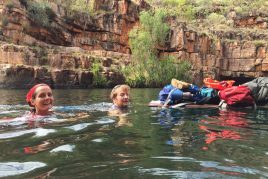 We did a lot of amazing walks in Karijini National Park and the most amazing part of the trip was swimming with the whale sharks, I absolutely loved this! If you want to travel around the west coast, I really recommend this company. Hopefully you will get Stu, he is an amazing guide. 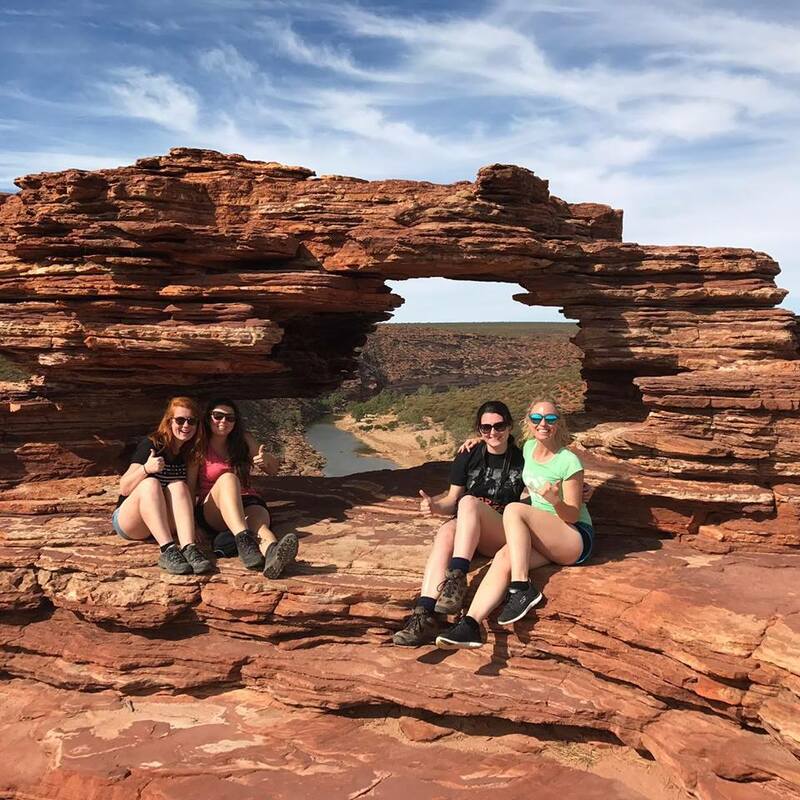 I’ve done the 9day Kimberley adventure tour from Perth to Broome and it was the best experience ever ! The landscapes, nature and animals (especially the whale sharks) were incredible ! Our guide Stu was awesome, extremely passionate, knowledgeable and full of energy and make everything possible for us to have the most unforgettable experience !